You’re lucky: thanks to great marketing, you or your company have been found on the internet by a would-be customer. Her name is Sharon and you just had a great sales call with her. She’s a mother of 3 and srsmall business owner in Des Moines, Iowa. After your call, Sharon decides that she’s interested in your services and possibly doing business with you. She’s been around the block and knows that a credit check, looking you up on D&B and background checks are not enough. Plus, they cost money. Sharon decides to Google you and your company. There are plenty of great reviews that happy customers have left all over the web, but before Sharon could read these stellar reviews, she finds the one bad review left by a previous client who lashed out to soil your good name in order to avoid paying their last bill. Or maybe it was a competitor running a smear campaign. Who knows. In either case, Sharon is already turned off to your services but decides to dig a little deeper. She checks Google Images and finds a picture of you and your Bros at your buddy Eric’s bachelor party. Now she’s really turned off, you never hear from her again and you have no idea why. When this happens, it’s time to engage in an Online Reputation Management, or ORM campaign. This is where Consorte Marketing can help. Through our internet reputation management methodologies, we will research the positive and negative information about you or your company that can be found on search engines and social networks to understand how big your reputation problem is. We will also do this to qualify you as an ongoing customer. At the end of the research phase, you will receive a deliverable that includes where this information can be found, how it can be found, and a strategy for suppressing it. It is typically very difficult to physically remove much of the information floating around in cyberspace unless you can prove that it is falsified and defamatory. In cases where competitors slander your reputation, we may conduct research and contact the webmasters and decision makers at various review websites, forums and blogs and request that they take down any false or misleading information. In cases where domains are hidden behind a wall of private registration or are uncooperative, we will refer you to an attorney who specializes in internet law to help you with resolving the issue through legal channels. 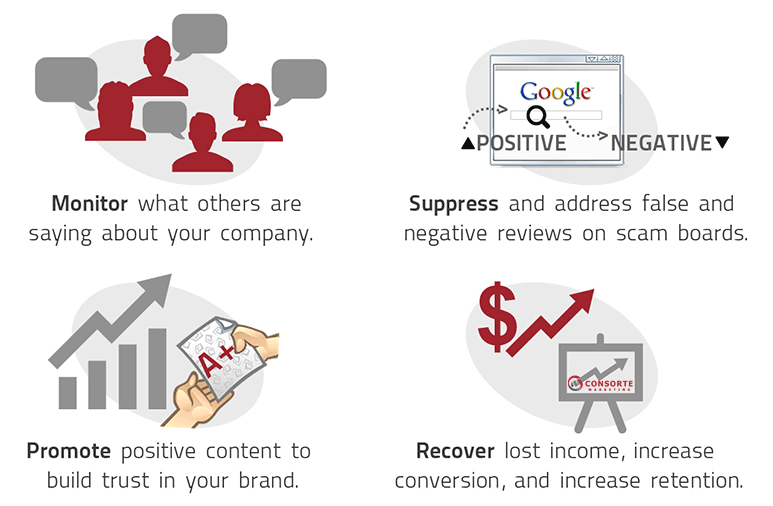 However, the most effective ORM strategies focus on the suppression of negative content. If there is a blog article or negative press about you on page 1 of Google or Bing, we will develop a strategy and then execute it to get this negative information pushed to page 2 or 3. If there is a customer who had a legitimate concern about your products or services, we’ll work with your customer service team to address the problems in a timely manner, and convert a disgruntled customer into someone who retracts his or her statements with a thank-you or an apology as we transform him or her into a brand ambassador. It is a long term strategy and there are no magic bullets or guarantees. However if it can be done, we’ll do it. During the research phase, we will also weigh the pros and cons of taking you on as a long term client. We’re interested in doing business on an ongoing basis with people who have integrity. It’s ok if you’ve had some bad luck in the past, or made a mistake here and there. We all have, and we’re happy to help you get back on your feet. If there is a fit, then we will offer to be your ongoing reputation defender under contract, to proliferate good thoughts and reviews about you and your legitimate business while suppressing the negativity. Be sure to read our reputation management case study.